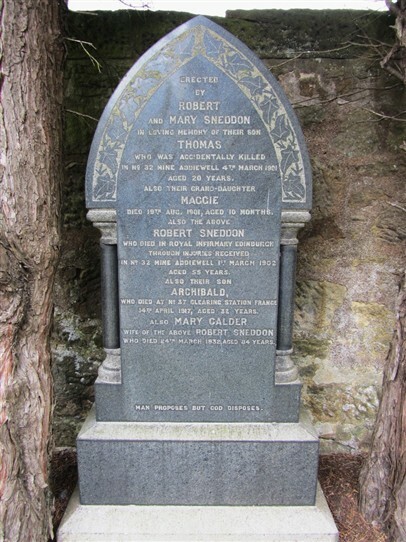 The Sneddons' gravestone in West Calder Cemetery. Wandering round West Calder cemetery, I came on this gravestone which records four tragedies in one local family. Robert Sneddon, a shale miner, married Mary Calder in 1876. They set up house at 5 Dickson Street in West Calder, and had a family of seven: five boys and two girls. All the boys following their father into the shale industry. On 4 March 1901, when he was just 20, Thomas was killed in an accident in Addiewell no. 32 mine. He died of complications following the fracture of his thigh. Just five months later, Robert and Mary's grand-daughter Maggie died at the age of only 10 months. But poor Mary Sneddon's troubles weren't yet over. Her youngest son Archibald served in the army in the First World War. On 14 April 1917, aged 32, he died of his wounds in No. 37 clearing station, in Flanders. Mary lived on to the age of 84, dying in 1932. I've just found out that No. 32 mine Addiewell, was not in fact at Addiewell, but at Polbeth - roughly where the football pitch is, beside the children's playground in the Burnside Road area. It was called Addiewell no. 32 because it was one of the many mines that supplied shale to the Addiewell Oil Works. Mines names and numbering are something of a minefield (!). In addition to the name, a mine might have a number, and also a nickname. For some time, the Local History Library has been compiling a list of mine names and nicknames. For instance, do you know where the North Pole, or the Latch were? If you want to have a look at the, here it is. If you can add any names or nicknames, let us know here. This page was added by Sybil Cavanagh on 03/12/2015.